Cambridge University Press, 9781108015639, 728pp. 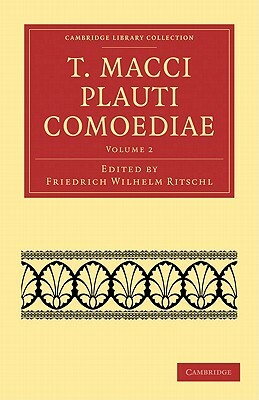 The foundation for the modern study of Titus Maccius Plautus rests on this monumental four-volume edition, begun by the eminent German philologist Friedrich Ritschl and completed by his colleagues Gustav Loewe, Georg Goetz, and Fritz Scholl. Scrupulously edited from existing manuscripts, including the famed Ambrosian palimpsest, this edition offers valuable insights into the metrics, literary and historical contexts, and textual history of the Latin comedic playwright. Volume 2 (1881 1884) includes editions of Aulularia, Amphitryon, Mercator, Stichus, and Poenulus. Each play is provided with a thorough preface, analysing the work's structures and themes and explaining its reconstruction from manuscript. A central contribution to the study of Plautine drama, Ritschl's Comoediae is also a remarkable achievement of textual criticism, a model of nineteenth-century philology at its most ambitious.